Our off-grid solutions include solar power and battery storage and result in complete grid independence. Pure Electric are the off-grid energy experts who provide complete off-grid solar system packages Australia wide. Pure Electric are a leading supplier of off-grid solar systems and off-grid solar power solutions, including stand alone solar power. We are leading experts in the field of off-grid systems and only use the best quality and most reliable equipment. 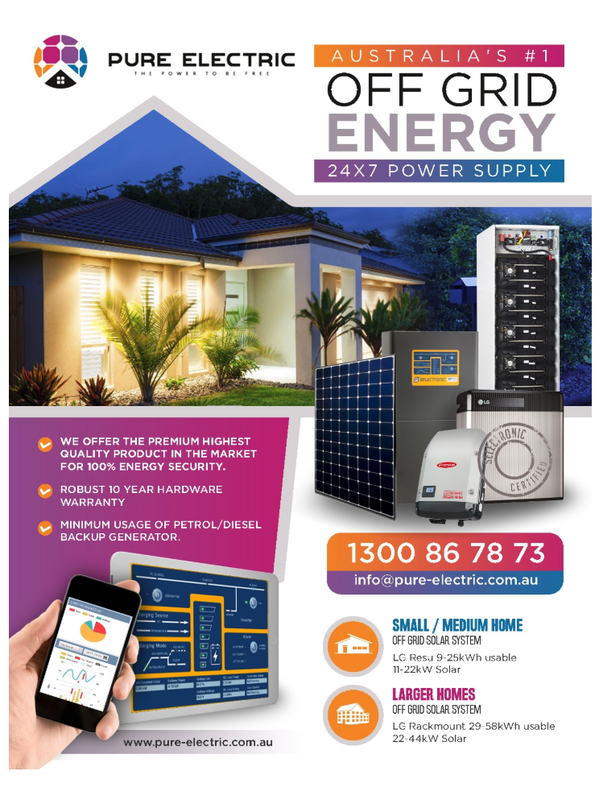 Why choose Pure Electric, Australia's # 1 Off Grid Energy 24x7 Power Supply? We only use the highest quality products on the market, for 100% energy security. We offer a 10 year hardware warranty. Our systems are expertly designed so that minimal usage of a petrol/diesel back up generator is required.